Arguably, the first Hatteras ever built—Knit Wits—set the stage for the continuing evolution of fiberglass boatbuilding today. How does the legendary old girl stack up against a modern successor? Given my touted abhorrence of all things intellectual, I find it hard to see how I got so darn captivated by Mr. Darwin’s The Origin Of Species a couple of weeks ago. 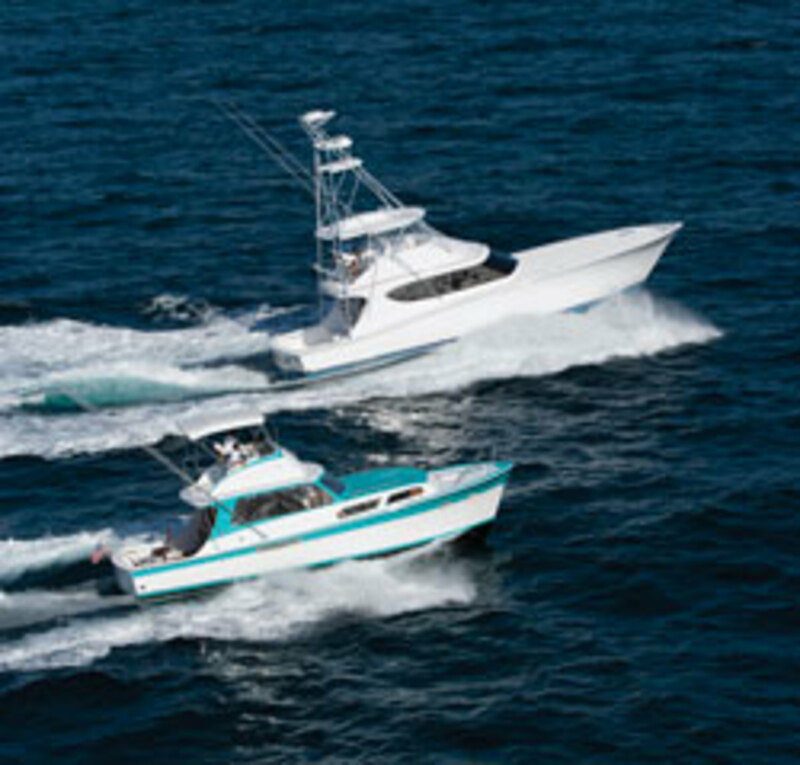 I was, at the time, consecutively sea trialing two very disparate Hatteras sportfishing convertibles: Knit Wits, a 41-foot, fully-restored blast from the past (see “What Price Glory,” ▶), and a GT60, a freshly minted, state-of-the-art battlewagon. It all started innocently enough, I suppose. First off, the big-time performance-related differences I was seeing between the two vessels, one launched in 1960 and the other in 2014, got me to thinkin’. And then, doing subsequent sets of comparative walk-throughs, aesthetic evaluations, and engine-room tours, with the Ft. Lauderdale, Florida, sun beating down, got me to thinkin’ some more. Which is not to say that the gorgeous old beauty wasn’t a tad controversial in her day. Indeed, at the hour of her launch on March 22, 1960 in Morehead City, North Carolina, critics were coming out of the woodwork. After all, she was the very first all-fiberglass vessel of her size to go down the ways in America, perhaps the world, and there were lots of folks who were chary of the new, largely untried boatbuilding material, most of them gloomily prophesying catastrophe. “You wanna bet?” Slane shot back. Knit Wits’s turquoise trim was the first thing to catch my eye as two Hatteras guys and I walked down the dock at Lauderdale Marina that morning. 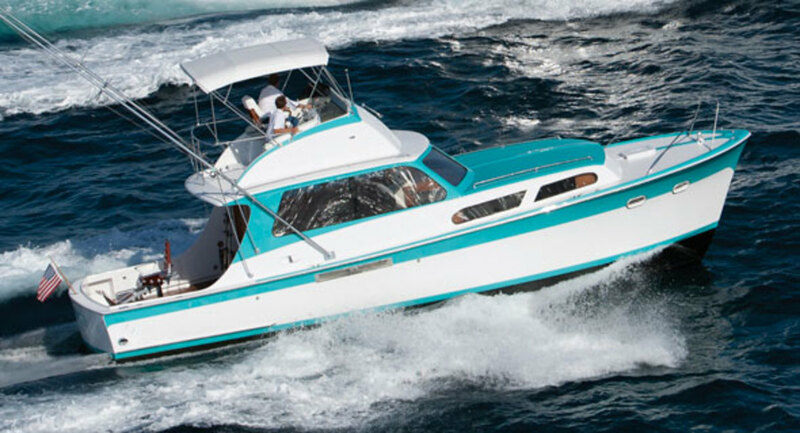 The cool topicality of the color swept along the boat’s faintly curved sheerline, made her superstructure glow with a Bahamian flair, and topped off her flying-bridge cowlings with equal amounts of grace and flamboyance. The effect was warm, inviting, perhaps even poetic. 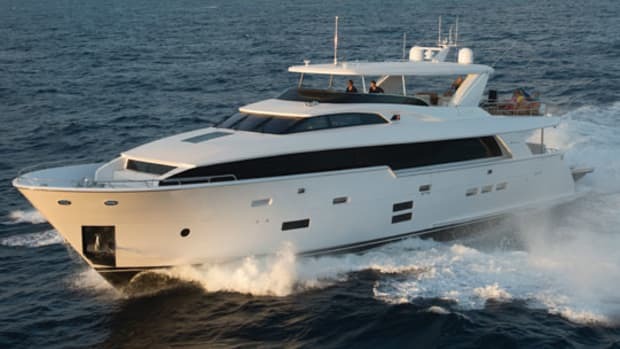 “And now for a more contemporary look,” I noted as the GT60—a much larger vessel, of course—hove into view, also tied alongside, just a few steps farther down the line. She was almost monochromatically white, with only a dramatic black windshield band for contrast. 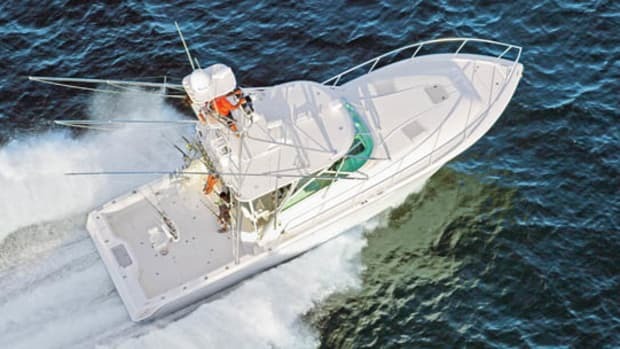 The simplicity of the color scheme, when coupled with the boat’s towering immensity, engendered an altogether different effect, one of great possibility and raw, heroic, eye-blinking power. As we all stood there admiring the two vessels, I picked up on another major aesthetic disparity. By comparison with Knit Wits’sstraight lines and angularities, the GT was voluptuously curvaceous, a state of affairs that produced a rockety, projectile-like appearance, as well as a highly aerodynamic shape that promised git-down, go-to-town speed. 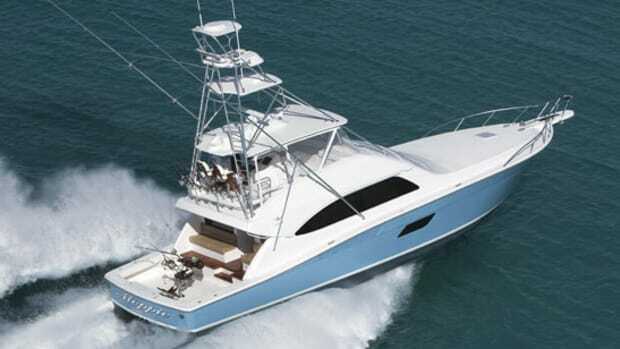 Then finally, an additional difference manifested—while the helm on Knit Wits’sflying bridge was small, sparsely outfitted, and located just abaft amidships, the GT’s helm was huge by comparison, outfitted with a lounge area, lockers galore, and positioned much farther aft. Why? As luck would have it, the seas in the open Atlantic—4-footers mostly—were coming out of the southeast once Knit Wits and I ventured beyond the Port Everglades jetties. 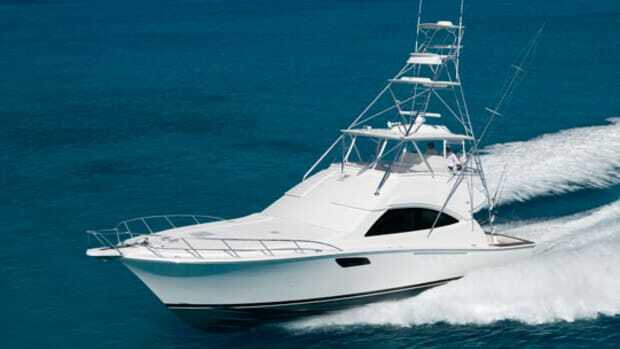 While this sort of thing tends to produce fairly sporty conditions in the Lauderdale area, the GT had easily shouldered the ruckus aside during her sea trial an hour or so earlier, turning in a thunderous top end of 40.2 knots and providing arrow-straight tracking (up-sea, down-sea, and side-sea), a bone-dry ride (thanks to modern, seakindly convex bow sections), broad-beamed lateral stability, a stunning level of fish-fighting back-down prowess (due to a curved transom and oodles of horsepower), and plenty of limo-like comfort. The very same conditions, however, eventually sent Knit Wits and I back to a relatively calm stretch of the ICW where getting accurate performance data seemed way more feasible. But prior to our abandoning the field of battle, I was able to gauge how the lovely old boat stacked up against the GT in terms of handling, ride quality, and steering control. 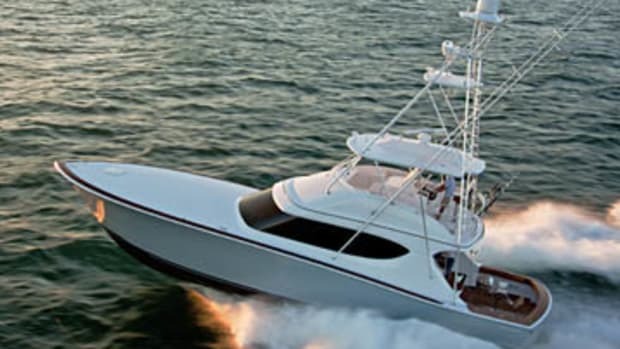 “Whooee,” I remarked as Knit Wits’s bow (with ’60s-era, not-so-seakindly concave sections) hammered a headsea at a slight angle, sending a sizable bout of spray across her flying bridge. The impact was such that pushing the boat’s modest 400-horsepower Detroit Diesel 6V-53TIs much beyond two-thirds throttle seemed unwise. “She tends to be a little wet—I gotta say,” I opined to those still dry enough to listen. I turned down-wind, running obliquely toward the beach, and Knit Wits slewed from side to side, a condition I could not easily correct, even by working her steering hydraulics with a will. “She’s gotta have some pretty small rudders, too,” I continued, even as the boat’s flat transom (as opposed to the GT’s bowed transom) and fine bow (as opposed to the GT’s fuller one) contributed to the yaw. Things got even jollier when I headed ’er back toward the jetties, running pretty much side-sea. Knit Wits exhibited a tendency to roll, in large part, I’d say, because of her comparative narrowness as well as a lofty vertical center of gravity, another ’60s-era foible generated by the absence of low-lying weight from big engines and fuel tanks. Knit Wits’s average top hop on the ICW was 22.7 knots, a rousing velocity that felt so exceptional (given the relatively modest horsepower ratings of her engines), inspiring, and validating that I was rendered momentarily speechless, once I’d backed ’er down to gather my thoughts. One environmentally-iffy negative obtruded, though—we’d blown a good bit of black smoke during our upper-end speed runs, which by the way was a far cry from the chaste, virtually invisible emissions produced by the GT’s super-sophisticated Caterpillar C32 ACERTs. Maneuverability turned out to be an issue as well. 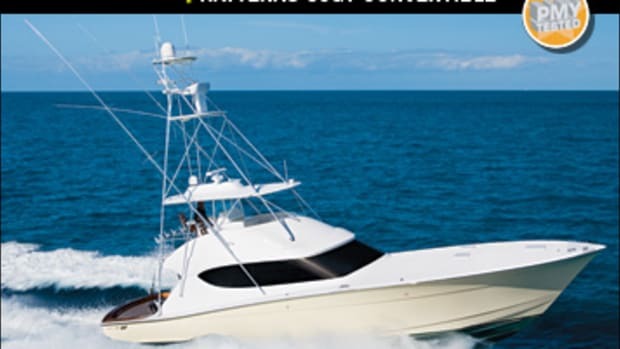 While the GT seemed stunningly agile thanks to her modern, electronic Palm Beach-style, single-lever engine controls—I mean, you could actually make the huge vessel spin a tight, one-boat-length-across circle while backing down at 7 or 8 knots—Knit Wits seemed clumsy and slow. The culprit? Her straight-mechanical, split-type engine controls, with two gear levers on one side of the steering wheel and two throttles on the other, were simply tough (i.e., complicated) to manipulate. 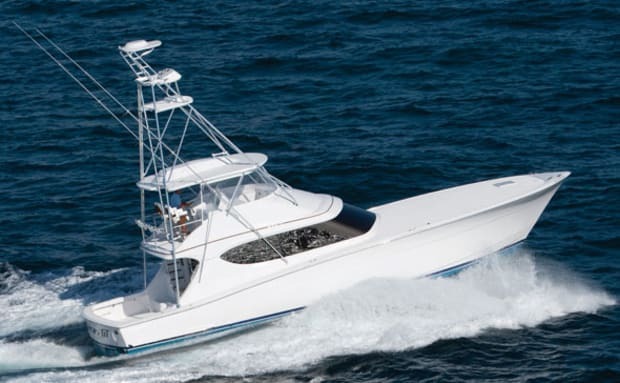 Once an owner takes possession of a GT, she’ll likely be outfitted with a couple of high-end, AIS-and-weather-enabled plotters, one or more touchscreen radars, a few VHFs, a mélange of world-class communications equipment, and any number of other technological marvels that will make her a sea-safe, self-sufficient globetrotter. What Knit Wits carried when she first hit the salt in 1960 was mind-bogglingly simple by comparison, although it was cutting-edge at the time. Imagine: a Bendix RDF (Radio Direction Finder), a Pearce-Simpson radiotelephone, a Bendix Fathometer, and a compass—that was about it! The same deep, technological chasm yawned when I examined the engine rooms of the two boats. Knit Wits’s machinery space was accessed via a small hatch in the saloon sole—the place was crowded, claustrophobic, offered poor service access, and hands-and-knees headroom only. 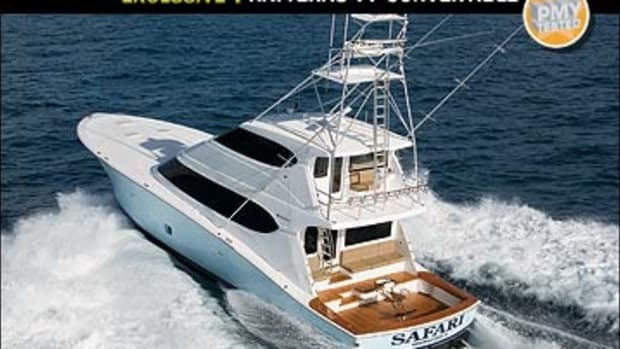 The GT’s, on the other hand, was accessed via an ample fiberglass companionway through a luxurious sofa-equipped mezzanine area. 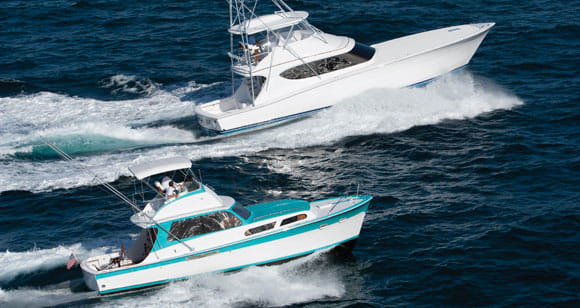 Moreover, it was a voluminous, bright-white extravaganza, replete with standup headroom and everything from Tides Marine dripless shaftlogs to high-capacity Racor fuel-water separators. And the amenities? Because Knit Wits is way smaller than the GT60 it makes sense to give her a break on her dimensional shortcomings. But still and all, during my walk-through of the old boat it seemed to me that virtually everything onboard (from berths to settees to helm stations) was really, really small. 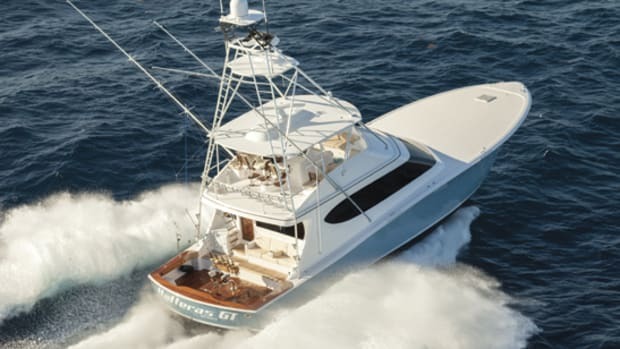 An explanation of sorts arose, though, as I squeezed through the super-tight, 2-foot-square access opening to the flying bridge for the third or fourth time—Americans are generally larger these days than they used to be. Much larger. The appliance quotient was the last thing I looked at? Did Knit Wits carry a washer the day she was launched? A dryer? Dishwasher? Residential-style refrigeration like the GT? Nope, try a Princess propane stove, an icebox, and a serviceable but inelegant sink! As my day with Knit Wits and her modern successor drew to a close, I had one final chance to study the two vessels, side by side, in the late-afternoon light. Yes, the older boat was comparatively narrow, spartan, and difficult. She had neither the whopping power-to-weight ratio of a modern resin-infused speedster, nor the safety and entertainment options. And really, she had little in the way of comparative comfort. But the lovely, legendary old girl had something else—an elegant and very exclusive cachet. 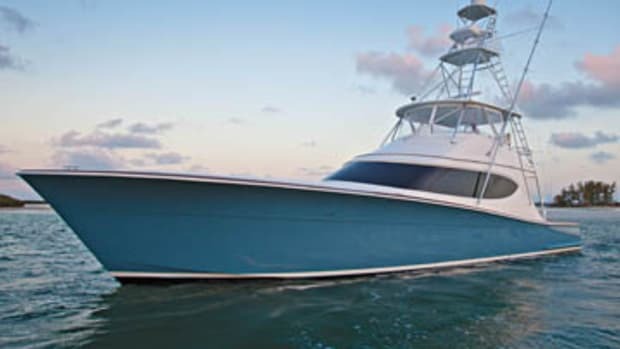 By leading the way forward during the early years of a nascent industry, she’d helped make modern fiberglass yachts—even super-sophisticates like the GT60—what they are today. She’d served, in a very real sense, as the origin of a thriving and burgeoning species. And because of that, it seemed (and seems) to me that she deservedly stands as a repository of genuine greatness. Mr. Darwin, I’m sure, would heartily agree.